The antique African Ewe Kente cloth is heir to a long and rich historical and artisanal tradition. This history connects and demonstrates the philosophy, oral literature, religious belief, moral values, and political history of the West African who wove them. A popular folk tale legend has been told among the people of Ghana, West Africa. This story tells of two young friends who were inspired by watching a spider spin her web. The spider, called Ananse, taught the young men to create the designs of the Kente Cloths. The African Kente cloth is a type of material that is composed of silk and cotton thread. It is made by a strip-weave technique that has been used for centuries. This textile art are woven in the Akan Ashanti territories in Ghana and the origin of these magnificent African Kente textiles is the Akan empire of Bonoman. In this region, the Kente cloth is known as nwentoma – which literally means “woven cloth”. One theory of the origin of the Kente Cloth name comes to us from the Ewe inhabitants of Ghana. These African people hypothesize that the weaving of the Ewe Kente cloth originated with them. They also lay claim to the name and state that it comes from “Kete”, which is derived from the combination of “ke” and “te” in the Ewe language which means “open” and “press” (terms that are associated with weaving). However, the principal artisans of antique African Ewe Kente cloths are the Bonwire people of Asanteman who live in Ghana’s Ashanti region. Another possible origin of the name “Kente” is “kenten” means basket in Asante Asante. Antique African Kente cloths are treasured among the indigenous peoples of the Ashanti Kingdom. At one time, it was an Akan sacred fabric and was worn by royalty for special occasions. In our current contemporary times, the Ewe Kente cloth is enjoying great resurgence popularity. This is why many people, from all walks of life, wear these breathtaking colorful garments in a variety of print and woven interpretations. The African Kente textiles are appreciated by the Akan people for the name, as well as their design patterns and colors. Although identified mainly by the designs, the names are derived from sources that include history, royalty, plants, proverbs, historical achievements, adages and famous personages. Each pattern is given a name, and each cloth is named as well. Some of the names come from the weavers, who are inspired, they believe, by the world of the spirits. Elders and chiefs sometimes provide the names, especially if they are commissioning the cloth. 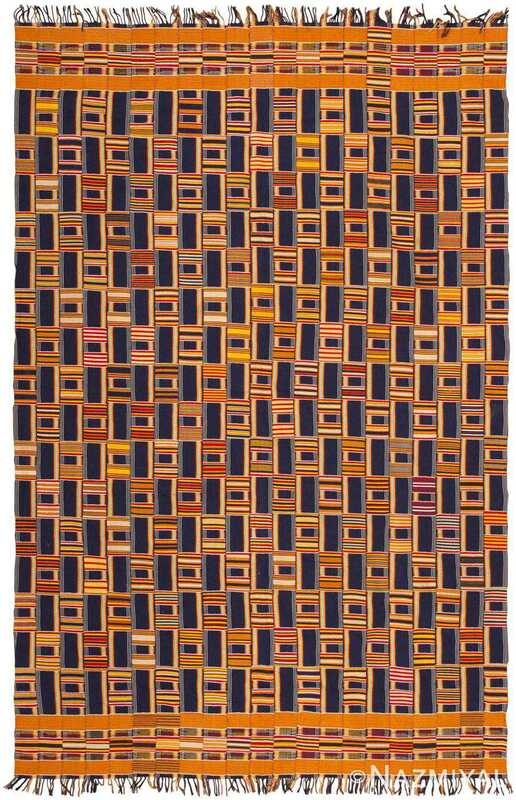 An African Ewe Kente cloth, which is created from slender bands of cloth, about four inches wide, is woven on a horizontal strip loom. These strips of material are arranged and hand-sewn to generate a piece of fabric. The weaving of the Kente cloth is created by crossing a row of threads running horizontally, called the wefts, with a row that runs vertically, called the warps. As the weaver divides the warp threads, he or she uses a shuttle to interweave the weft threads between the warp. The weaver generates patterns, rich in symbolism and elegance, by alternating colors in the weft and the warp. The patterns can range from the simple to the intricate. They tell of abstract themes, impart stories, and bespeak of aspirations. Pink: Connected to the female life force. Red: Political and spiritual; death and sacrificial rituals. Purple: The feminine forces, often worn by women. Yellow: Wealth, fertility, royalty, and beauty. Blue: Harmony, peace, and love. Green: Planting, harvesting, and spiritual growth. Gold: Royalty, glory, and purity. Grey: Cleansing and healing rituals. Silver: The moon, serenity, joy, and purity. Black: Spiritual energy and maturation.